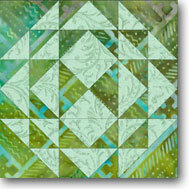 The Arrowhead quilt block is another name for a pair of stacked Flying Geese units. 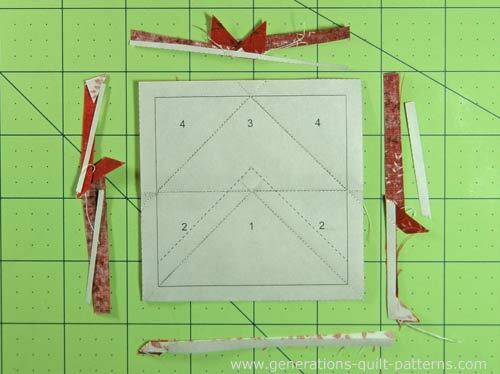 This tutorial shows you how to paper piece them efficiently so that they are both fast and accurate—all without lopping off the top points of the Geese! 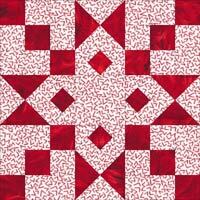 On this page you'll also find downloads for this basic pattern in 5 different sizes along with illustrations of several other blocks that carry the 'Arrowhead' name. Pairs of Flying Geese such as these are used as units within many other blocks. If the block name is underlined, click it to go to the instructions to make it. 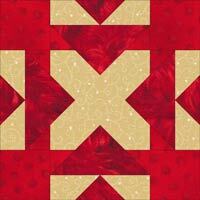 Hate paper piecing? 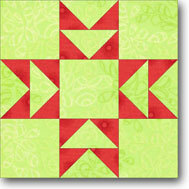 Click here for alternative methods to construct Flying Geese units. 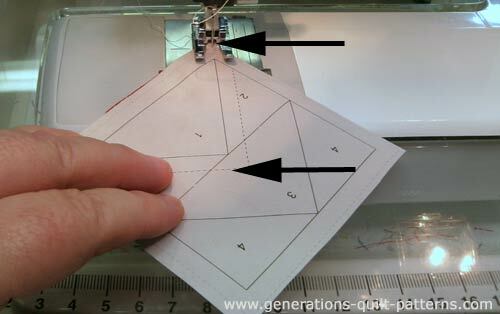 Install an open toe applique foot for the best view of where your needle pierces the paper. 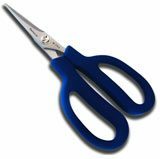 Shorten your stitch length to 15-18 stitches/inch. If you find it hard to remove the pattern at the end, insert 90/14 needle. 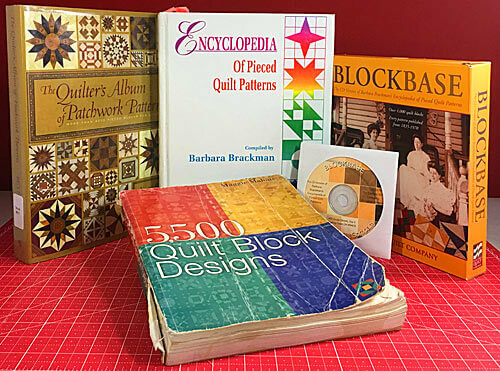 Because I use paper specifically intended for paper piecing (you can find a link to my favorites in the right column on this page), I find that my everyday 80/12 Microtex Sharp works just fine. When you are instructed to 'Press', first press the pieced unit flat to set the seam. Then open the patch, pressing from the front. 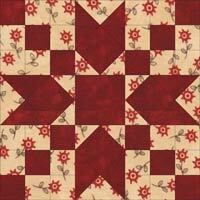 You may want to reduce or eliminate the use of steam for pressing these paper pieced blocks. Steam tends to curl the paper.I starch all my fabrics before piecing. You can learn why and how by clicking here. 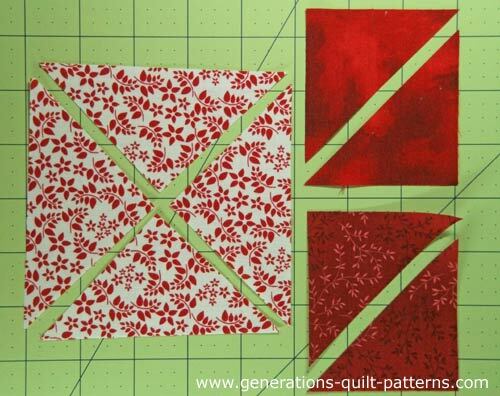 Take a minute to review our favorite technique to make the flattest quilt blocks ever! It works even with the paper attached. 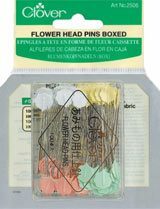 These patches are generously sized to make patch placement as foolproof as possible. Make a couple of blocks. Fine tune the sizes to your needs and note any changes on a pattern and file away for when you need it again. All the dimensions are for cut squares. 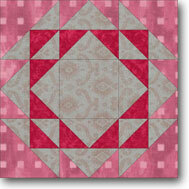 For example, for the #1 Patch for our 3" finished block cut one 4-5/8" x 4-5/8" square, then subcut it diagonally twice. 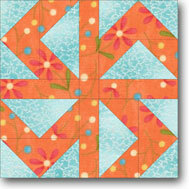 Our block uses two different 'sky' fabrics (Patches 2 and 4). It's perfectly acceptable to use a single fabric instead. 1, 3	 A	 1	 3⅛"	 3⅝"	 4⅛"	 4⅝"	 5⅝"
2	 B	 1	 2⅛"	 2⅜"	 2⅝"	 2⅞"	 3⅜"
4	 C	 1	 2⅛"	 2⅜"	 2⅝"	 2⅞"	 3⅜"
Click here to see the cut patches for the Arrowhead quilt block. 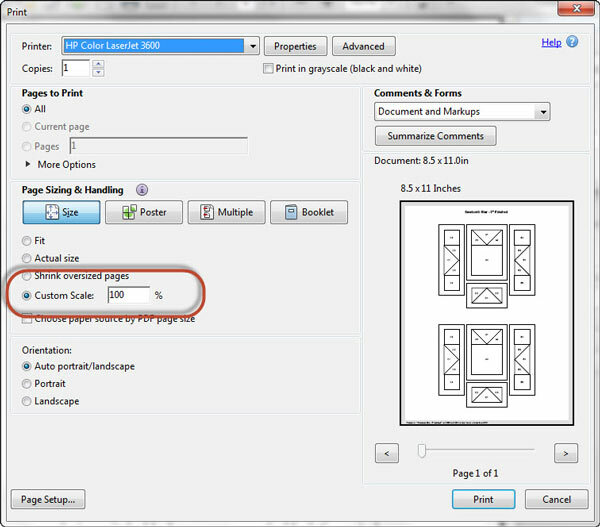 Cut one unit from the page you downloaded, cutting just outside the dotted line. Save the others for another project. 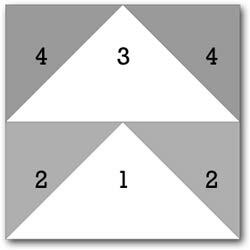 With right sides together, (RST) align the long bias edge of a #2 triangle with one of the short sides of #1 (Fig. 2). It doesn't matter if you do the left or the right side first, though consistency makes it more efficient feeding the units through your sewing machine. Stitch the seam starting about a 1/4" inch before the line begins and stopping about a 1/4" after the line ends (black arrows). Press. 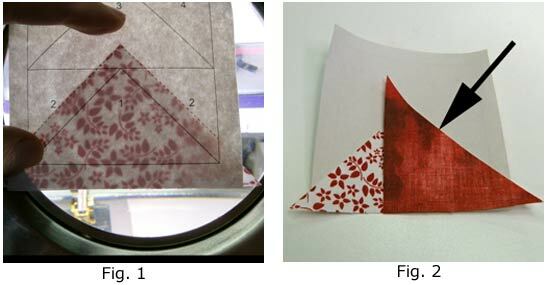 Since these fabrics were starched before cutting, I am able to fingerpress this small triangle open (Fig. 3) saving a trip to the iron. 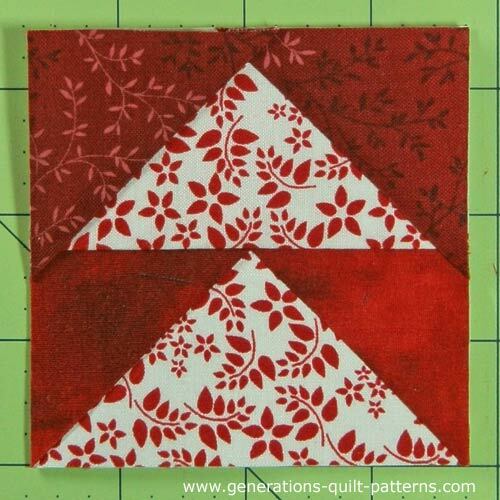 Add the second #2 triangle in the same manner, again matching the bias cut edges (Fig. 4). To create the placement line for #3, line-up the edge of your ruler with the solid line (at the arrow) in the middle of the block. 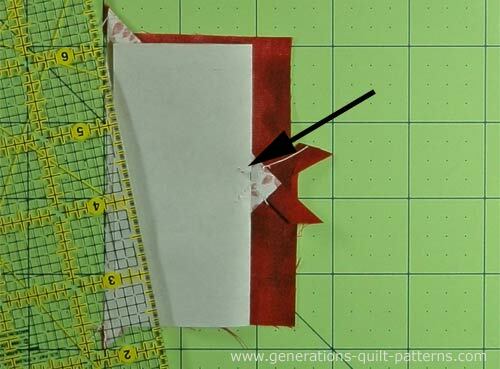 Use your thumbnail to crease the pattern along the ruler's edge. 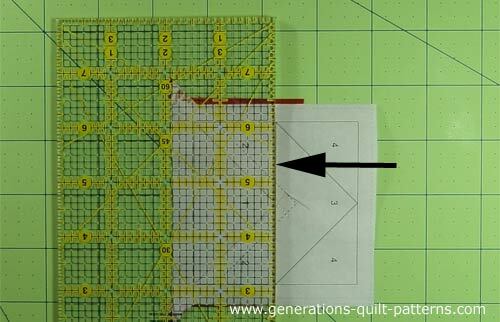 Remove the ruler and fold the pattern back along the crease line. At the arrow you can just see where the stitches were pulled out of the paper to get it to lay flat. That's exactly how it should be! 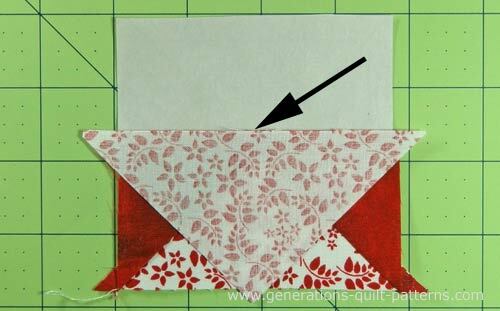 Align the ruler's 1/4" mark (at arrow) with the folded edge and cut off the excess fabric with your rotary cutter. 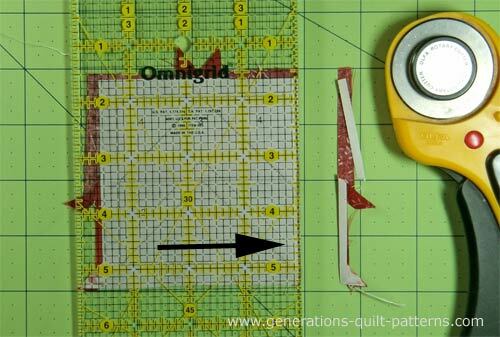 While I learned to paper piece using my everyday ruler—and use it to this day for this step—many quilters prefer to use an Add-A-Quarter Plus ruler. It comes either 6" or 12" long or in a combo pack. 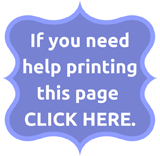 The Plus version has a tapered edge to fold the paper pattern back over. This is a vast improvement over the original Add-A-Quarter. 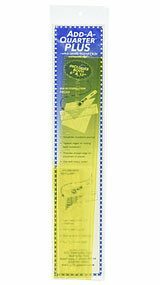 Learn more about this ruler here. You've just created the placement line for your next patch. 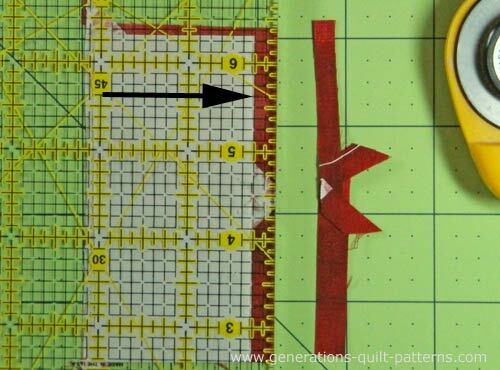 Match the long edge of #3 with the cut edge (see arrow below). Stitch from the right side, again starting and stopping a 1/4" off the line. Again, trim to establish the placement line for each short side of #3. 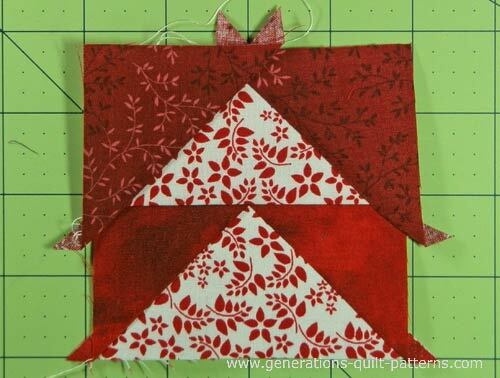 Add both #4 triangles, pressing after each is stitched. 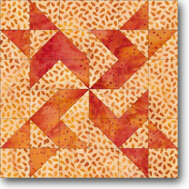 After the sewing is complete, your Arrowhead block looks like this. The point at the top of each goose is nice and pointy! But the block looks pretty scruffy at this point. I don't bother to trim the thread tails at the outside edges until the block is finished unless they are in my way. To trim the block to size (3-1/2" for our example) match the 1/4" mark on your ruler with the solid black outline of the block and trim with your rotary cutter. Then repeat for the remaining three sides. All those stray threads are now gone with no extra effort! 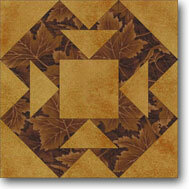 Remove the paper and your finished Arrowhead quilt block looks like this. 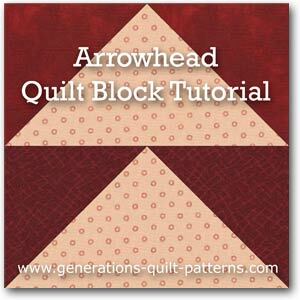 It's common to have many different blocks use the same name and the Arrowhead quilt block is no different. No relationship at all to the block in the tutorial! Another completely different block. This one also goes by the names: Her Sparkling Jewels, The Gem Block, Idaho, Sparkling Jewel—much more appropriate names, don't you think!? 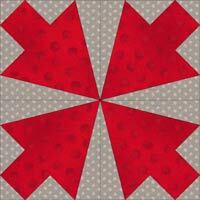 Though it might look like it from the picture, this pointy Arrowhead quilt block is composed of parallelograms, not diamond shapes (as in a LeMoyne Star). There are several versions of this next variation. The one on the far right is actually called 'Arrowheads' in the plural. 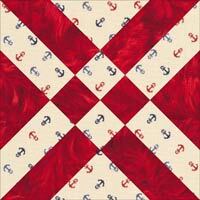 This one looks the most like 'arrowheads'! 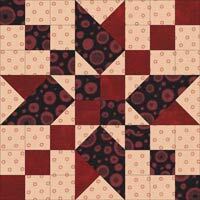 And our final block also goes by the plural, 'Arrowheads'. Your arrow hit it's target! 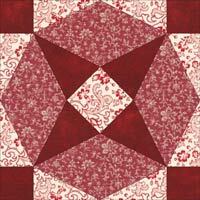 You've hit the bull's-eye with the Arrowhead quilt block, but there's more blocks to be made! 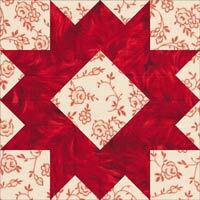 Click here to find your next one in our Free Quilt Block Patterns Library.